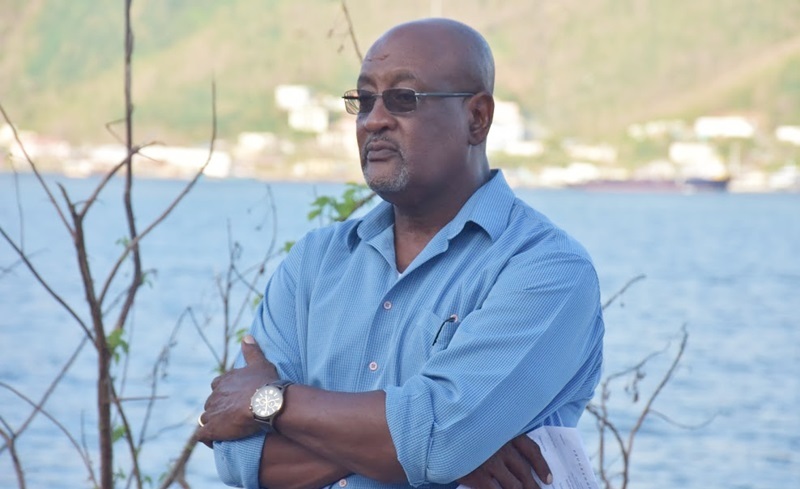 Minister of Health and Social Development, Ronnie Skelton said government is having trouble cleaning debris trapped on the territory’s hillsides. The minister said the government was rolling out a plan to have the hillsides cleared but their plan is now foiled. The remaining debris on the hillsides is now said to be virtually out of reach. “We were going to offer people $5 a sheet or $5 per tonne of material to bring to some location. But, as you can see, nature has rotated the plan and we are still thinking of other possibilities,” Skelton said. “Probably we have to wait until homes are built in the hills to recover that material again because it’s going to be very, very, very, difficult to recover most of the material. Some we can [recover] but some we will not be able to,” the minister added. Skelton made the statement while responding to questions at a public meeting in the Third Electoral District yesterday, January 30. Residents said hillside debris needs to be cleared urgently. Sheets of galvanized metal and other material were blown on hillsides during the category 5 hurricanes last year. There is a concern that the debris is a hazard because potentially strong winds can sweep them from hills and injure unsuspecting residents or visitors. It will be hard work but it is far from impossible. It needs fit men and boys with cutlasses, ropes and water. There is a lot of unemployment; temporary contracts could be issued to gangs of men supervised by public works and transported by safari bus as they are under utilized at present. While that may be true about St. Thomas, what they had to deal with was peanuts compared to the situation here. If you remember the state of the roads……..those had to be cleared, and a fine job the government did! I am not so worried about stuff on the hillsides, but there is still plenty of stuff on the road sides that they could be collecting. And aotumobiles in the bush and Salt Ponds where TOURISTs go bird watching. Ponds should be easy with a small boat and most cars are near a road or drive so could be retrieved with a small crane or even an excavator. Maybe they should focus on cleaning the ghuts instead. Plenty of junk there too. Ahhh thanks. At least someone has actually notice the ton load of debris in the guts. For goodness sake let’s not wait until the sky break lose to run and clean up the guts. We’re underestimating the kind of hell that can rain down and having all those blocked guts. can’t or won’t? this is achievable… since when did people just give up when the task is hard? No excuse for such an apathetic and defeatist attitude – the debris needs to be cleared and needs a Government to act, says it all when they throw in the towel to clear dangerous debris scattered about the place!!! If they can’t even do that what else have they not been doing or attempting to do? Residents want government to clean up their private hillside property. Where abouts are the worst areas for debris? hills and also roadside pls? Well when these debris turn missiles should another storm come….everyone will be asking who to blame. Seriously, Minister Skelton? Do you really believe the galvanized steel is going to sit up on the hills like a good boy and not move? Next hurricane we get, and it doesn’t have to be a Cat 5, that stuff is coming off the hill and blowing into people’s newly repaired windows. Get it off the hill before next hurricane season! In the US prisoners are brought out supervised to clean up roadsides as part of their community service. Get those prisoners to work around the island cleaning up. – the nearshore shallow water to 30 ft.
Not to mention, Mr Health Minister, that metal and plastic debris will collect and hold water. I am waiting in trepidation for the dengue/chickungunya/zika epedemic coming to a place near you soon.